All it had then was the bit of ribbed cuff, and there it sat for months. Well, not there, but in a plastic work-bag to keep it from the moths. I realize now that I've made at least one technical mistake that's going to bite me...I added stitches at the top of the opening, to the sides would meet, and then knit two stitches together to join what had been the flat part rather than putting the stitches at the top on something I could knit off of. I did remember to slip the first stitch of each row when I was knitting the flat part (where it goes up from the stitch holder below the thumb to the join at the top--it's knit one way, purled the other.) I also may have added too many stitches (now on the stitch holder) but I was feeling my way along. (Was I following a pattern? Are you kidding? I am in knitting, as in so many things, a "let see if I can make this work" person, and since knitting can't electrocute me, stab me (these needles are fairly blunt), blow me up, shoot me or anyone else, or poison me...I play in a sort of childlike state of discovery. It's fun. It's not efficient, but then knitting is something I enjoy. It doesn't put food on the table. It would've been nice if I'd remembered that increases, like decreases, can lean left and right, but...again...discoveries. There's a bulgy bit on the back so far...but the straight needles are pulling the corners out. It may calm down. Or not. 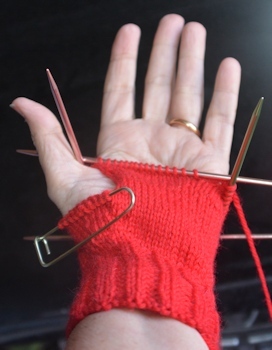 Next: I'll take it up to the top of my hand just past the big knuckles, and then see if I can get a half-thumb picked up and knitted in the hole there. The second one will be cast on with size 4 needles to start with (or moved to 4s after I do the ribbing--I really don't like tight ribbing) and what I learn from the first will be used on the second. On the funny side (sortakinda) I am still short 4 size 5 DPNs. That suggests they're in a project somewhere. Because I had (I'm almost-for-certain-sure) 30 of them, enough to have three pairs of socks going at once (and had had that, in fact) and 4 missing would be the four standing needles in something being knitted in the round. But what ELSE could I have been knitting? All my needles had been committed to socks for several years. And I had the needles off the pair I'd finished up a few hours before...some of which I used for this, and some of which I put somewhere in my luggage. Surely, they'd have been in the Ziplock that the sock-in-progress had been in. And I would've pulled them out of that and put them in my big "stays at home usually" needle bag. Wouldn't I? Apparently I didn't, and put them somewhere else. That looks pretty impressive to me. At least, I *think* I remember that from the time I became fascinated (briefly) with topology back in the late '60s. Other things to learn: my hands, though apparently almost-nearly the same length, finger to finger and so on, are not the same circumference. This mitt is loose on my left hand now (as I get closer to the top) but fits perfectly on my right hand. Guess which is the dominant hand, and therefore the more muscled up, and with the more swollen joints. So I guess mitt#2 will be for the left hand, and I'll make it about a half inch less in circumference. Since I didn't decorate the back of the mitt, it could be for either hand--later I want to make some with cabling or patterning on the back side. Oh, and I finally remembered where the other size 5 DPNs are. I had a KnitFAIL with a green and white start of a sock last summer, set it aside until I could figure out how to recover it, finally went on and knit the socks I wanted on other needles, and put that one...somewhere. Should've frogged it the moment I finished the lovely Mountain Vacation pair and recovered the needles. The ceramic object is so beautiful, may I ask who made it or if it has a special name? It's a yarn bowl. They can be very handy for keeping yarn from rolling across the floor especially if you have cats that enjoy chasing said yarn. Ha, ha! I see, how handy, and are the symbols typical too? Because those are quite beautiful and really speak to me. The color of your glove is very nice! There are many potters (and wood carvers) who make yarn bowls. This particular potter seems to use these symbols often. Many pieces relate to Tolkein's work, but not all. The yarn color is my favorite red, though I'm afraid the yarn mfg may have changed...it was Ella rae Classic #31. I've made five or so pairs of socks with it, wearing out two of them. Yarn bowls are great *except* that most of them will not take a ball (commercially wound or a cake off a ball winder) that is 100 g. of worsted weight yarn...which is the size I use most often. I use this one any time I'm working with smaller amounts of yarn (it handles 50 g of worsted just fine) as in striping a sock from yarn left from a larger project. I love it--just hoping to find something big enough to handle a full 100g lump, so I can knit outdoors with the yarn secure from wind, falling leaves and other stuff. 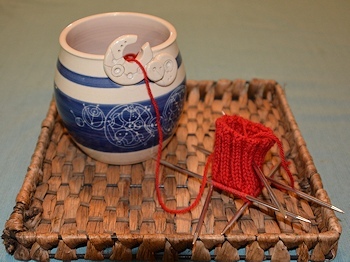 Your yarn bowl is so beautiful. Thank you. It was a lovely gift and I do treasure it.